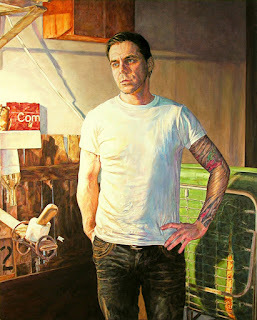 A portrait of my friend and studio-mate Neal E. Nolan, an installation artist and curator. A man with a lot of fingers in diverse artistic "pies". As part of the ACME series I asked Neal to pose in front of one of his works. Sadly this type of artistic work doesn't reproduce well in painted form... too 3-dimensional and structural. Being installations, they need to be actually touched and their constituent parts explored. Neal organises and runs a number of exhibitions around Western Canada. A man with huge amounts of artistic drive, entertaining experience, and pleasant to be around (mostly).